For as long as I can remember I have been fussy with food. I would be totally against even trying something new, and got completely stuck in a routine of sandwiches, toast and macaroni cheese. My mum doesn't cook at all really so when I lived at home I spent most evenings having a microwavable meal after school or college. I guess that's where my fussiness came from, I didn't really like the taste of new food, but probably cos it was pre-packed and full of salt and sugar. I found it quite hard to adjust when I first moved out. My other half loves cooking and was dead set about the fact we weren't having microwavable dinners. I still was pretty certain about what I did and didn't like and I was (and still am ) obsessive about my food not touching on the plate. By this I mean if I have something with beans, they can't touch the other food..Anyway, as I have mentioned before I have pretty bad stomach issues and am currently undergoing tests to find out exactly what is going on. I was advised to try and cut out dairy from my diet, which meant a lot of the foods I love were out of bounds. So then I didn't have a choice, my diet was limited so I plucked up the courage and tried new things. I'm so glad I got over the 'fear' and got to try these new flavours. Roasted butternut squash is literally one of my favourite things. The dairy free thing didn't work so now I'm back to eating what I want until I get more tests done..fun..There is a point to this post by the way! I just wanted to share my love for this.. Excuse the rubbish photo (stupid Blackberry). 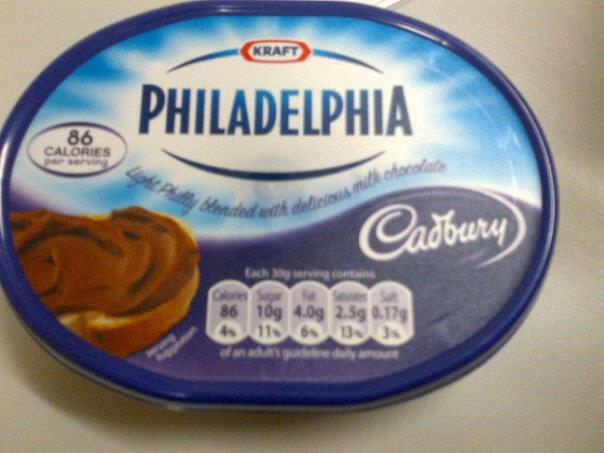 Who knew chocolate and cream cheese would go so well together? This is amazing. Really, if you haven't tried it you must! It is quite sweet so go steady on the amount you use but it is delicious. I tried it on crumpets earlier, as we have run out of butter, and it was yummy. It's kind of Nutella like but without the nutty taste.. Mmmmmm yum! I have awarded you with the Versatile Blogger Award! I tried this the other day but really wasn't too sure! And I love chocolate! Maybe I'll have to give it another go before I give up on it completely! It's just the idea that is so weird to me!